Mannose-binding lectin (MBL) is also known as mannose-binding protein, mannan-binding protein (MBP), Mannose-binding protein C, Collectin-1 (COLEC1), MBL2, which belongs to the class of collectins in the C-type lectin superfamily. 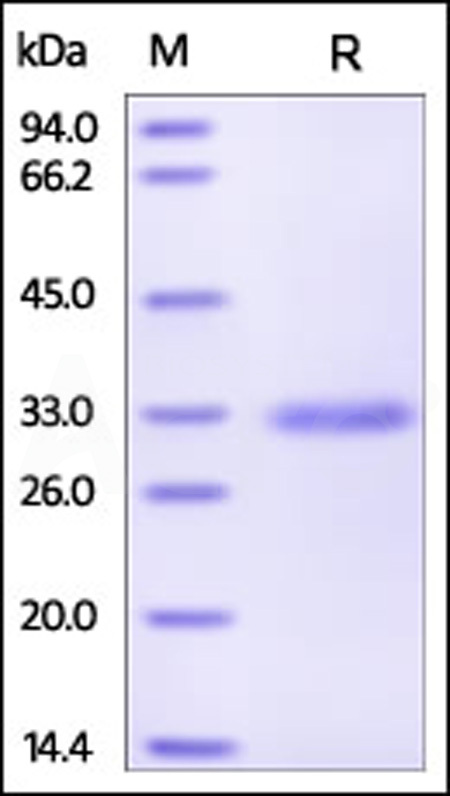 MBL contains one C-type lectin domain and one collagen-like domain. MBL has an oligomeric structure (400-700 kDa), built of subunits that contain three presumably identical peptide chains of about 30 kDa each. MBL is calcium-dependent lectin involved in innate immune defense. MBL binds mannose, fucose and N-acetylglucosamine on different microorganisms and activates the lectin complement pathway. MBL binds to late apoptotic cells. MBL may bind DNA. Nauta A.J., et al., 2003, Eur. J. Immunol. 33:2853-2863. Hirano M., et al., 2005, J. Immunol. 175:3177-3185.